Hardware clones are pretty common these days thanks to the relentless march of technology, and recently we've seen a host of 8 and 16-bit systems replicated by products like the RetroN 5, Supaboy and Super Retro Trio. 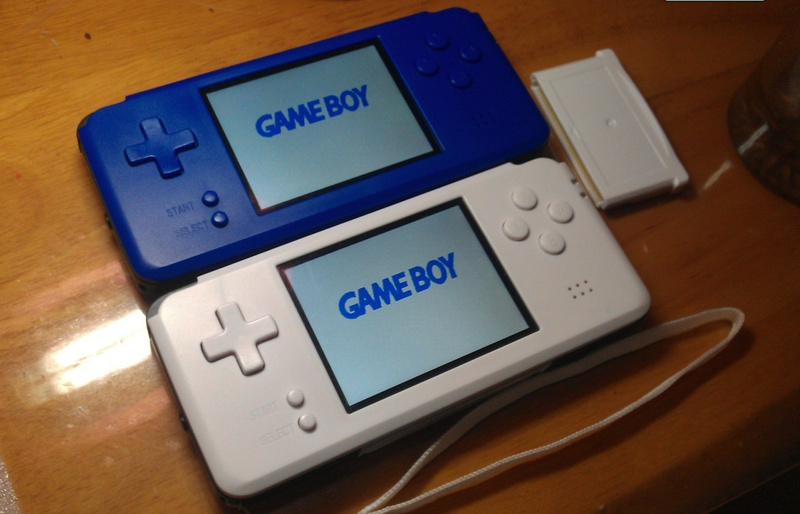 The Game Boy Advance is another classic console which has been cloned effectively, with the Revo K101 offering full support for official GBA carts and a whole host of other features, including link cable connectivity, TV-out, homebrew support, a backlit screen with different brightness settings, an image viewer, cheat support and a 890mAh internal rechargeable battery. The unit currently costs $69.99 and comes with a free carry pouch, headphones and 4GB microSD card. This isn't a new machine - it's been on the market for a while now - but the reason it has come to our attention is because our good friends at Rose Colored Gaming are getting ready to offer special case designs, giving the rather basic white console a much-needed splash of colour. We'll be reviewing this unit in the not-too-distant future, but in the meantime, let us know what you think by posting a comment below. Perhaps you own a K101 already? Look at that, it even put the Start/Select buttons on the left-hand side! Sure. I'll believe it when I see it. The pattern on that site is to directly go from "coming soon" to "out of stock". The only thing ever available are their t-shirts and posters. April Fools... all year long! The one thing I'd like to know is if it plays GBC cartridges. The site only talks about GBA cartridges. Same here, I'd like to see if it has GB/GBC support. God help me I preordered a K101 when it was announced. It sounded fantastic at the time, but it turned out to be a piece of junk when I got it. 1) The screen is bright but it isn't the same aspect ratio or resolution as the GBA so the image gets stretched and looks bad. 3) The video out looks awful and had a constant buzz from the audio while audio still came from the system. There are a number of better ways to play GBA games at this point. Do any of those. I'm sure the Revo folks hate me for saying it but just stay away. Oh and since people are asking, it doesn't support GB(C) carts. You can use roms on it, but they run in emulators and aren't terribly compatible with high end GBC games. While it's nice to see RCG expand their product range and for Chinese device manufacturers to reach out more to the international community, I have to tell people to avoid this. It's $69.99 for a very cheap feeling device and non-perfect compatibility (had to research about that compatibility part as the unit I received last year came broken). And about that last point, my unit arrived last summer broken, and the company that makes these things did not want to refund me or send me a new unit right away. I had to jump through hoops to do anything, and even after that it took OVER HALF A YEAR to finally get my refund. And that was after they went silent and seemingly went dead for a long while. You're all better off getting a used GBA or DS, or one of RCG's frontlit GBA mods OR one of J-Bit's Game Boy Macros (DSes with either a broken top screen or broken hinges or both that have been re-purposed as beautiful GBAs). Why does it have xy buttons? GBA only had A,B,R,L. $70? What a rip off! Still want to know why the X, Y buttons are on there and i want to know if it handles to play gameboy and gameboy colour games as we know its compatible with gameboy advance. "Given up the ghost." I'm from America, but I've never heard this phrase. "And Jesus cried with a loud voice, and gave up the ghost. — Mark 15:37"
I'd love one of these but they don't offer sleep functionality (you know, when you close your 3DS & open it up again when you want). I guess that's a limitation of the GBA architecture more than anything else, sadly. If you're looking to play GBA games do yourself a favor and get an AGS 101 model SP instead. They'll run the games better and the backlit screen is excellent. @ewzzy #1 was enough to be a dealbreaker. Not the correct resolution? GTFO. Not the correct resolution, so avoid. The resolution difference is barely noticeable, the image isn't even noticeably stretched. You will never find a good hardware clone that has the native resolution due to the price and rarity of those older screens. I may be incorrect but I believe the gamesave issue is extremely rare, and even if it does occur simply reloading the system will make said gamesave reappear. From what I have seen, the video out is actually quite sharp, although this is a feature I would personally never use. Gameplay is extremely good, playing if not all, almost all GBA games. If you are going to be using cartridges, then you might want to stick with just a regular GBA or DS, but if you want to run Roms, then this is probably your best bet. @MyBodyIsReggie The systems are in stock and availible for preorder, just not color cased versions. @James_mussell98 Because it can play SNES cartridges as well, don't you read?